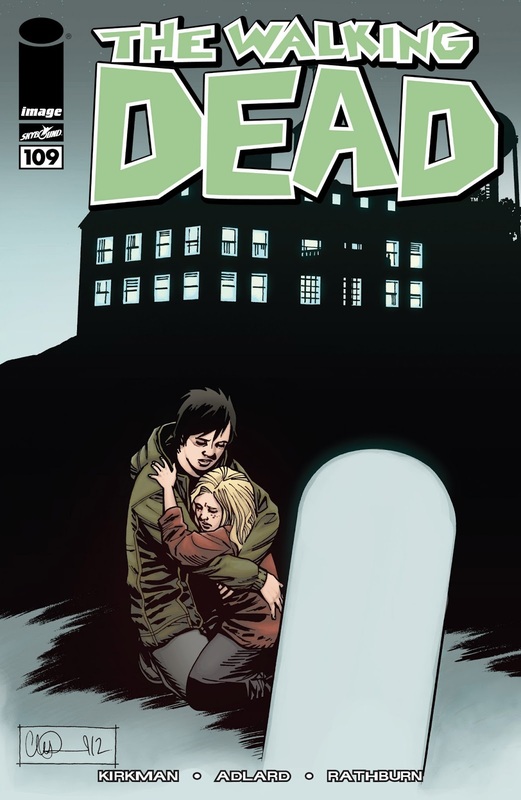 There will be spoilers of the contents of issue 109 from here on in. It’s a sure sign that you are a lapsed comic purchaser when you only have 1 title on your pull list and you don’t even get that excited when that 1 Wednesday in the month rolls around and you had barely remembered that your 1 title was due to be released. Maybe it’s taken me longer than expected to get over issue 108 (not really – I managed to make it to work next day and eat and sleep etc). Maybe I just don’t have the enthusiasm for this title compared to 5 or 6 years ago (closer to the truth). Anyhow – here we are with issue 109, which, by my calculation, will be part 1(of 6) of Volume 19. So lets not expect too many fireworks – although I suspect this arc will involve some sort of challenge to Negans authority (him and his saviours will have been around for nearly 20 episodes by the time we get to the end of this arc, so you would expect events to reach a crescendo). What I am trying to say is, not a huge amount happens in this issue. Maggie grieves for Glenn. She gets commended by a woman who really talks too much about how cool it is that she has a headstone for her deceased love (this scene goes on too long and is afflicted by the verbosity that causes word balloons to pop). Maggie visits the Hilltop Doctor (she is pregnant with Glenns child). Maggie meets the Hilltop Blacksmith. Jesus pops up and lets Maggie in on the big secret (ie Rick is going to beat up Negan). Jesus pops up all over the place at the Hilltop, very keen he is to spread the wonderful news that Rick is going to wait outside the school gates with his mates and give Negan a good kicking. The end result of this announcement to all and sundry is that one guy who Jesus thought he could trust – some Hilltop guard called Kal – appears to have done a runner straight to Negan to tell him the very same news. Jesus berates himself for being so stupid. Considering Jesus has not put a foot wrong so far in the comic, this moment poses the question that if he doubted the reliability of ‘Kal’, then why approach him with the news? Surely there would have been other useful people in the Hilltop community? Jesus seems to know them all anyway, so why go to the one that was potentially the weak link? Apart from all that excitement, Spencer makes his first passive aggressive move at Rick. It fails.And Carl has grown a floppy emo type fringe to hang over the abyss of his face. And his dad wants him fighting Negan, side by side, father & son etc. At least he won’t be whingeing about being left out of all the ‘fun’ now, or going all Scrappy Doo when he feels he isnt getting involved, and killing grown men with weapons bigger than he is as a result. Ezekiel Watch – there was not one Tiger in this issue. Shame.